April 24, 2017, 5:25 p.m. 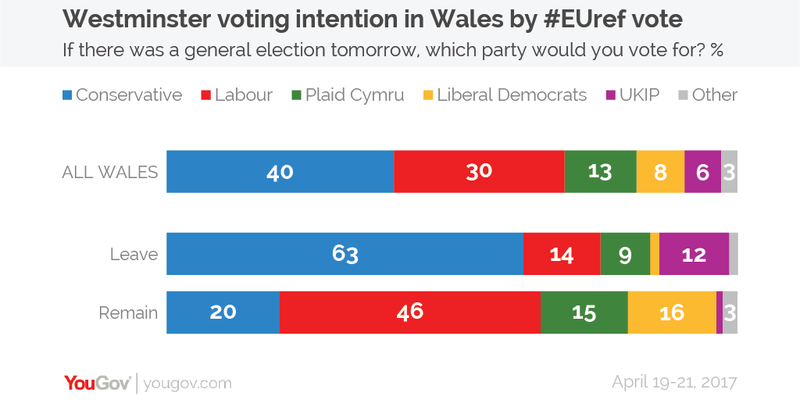 The latest YouGov/ITV Wales poll of Welsh voters shows figures of CON 40% (+12), LAB 30% (-3), PC 13% (-), LD 8% (-1) and UKIP 6% (-7). That Labour is falling is not a shock, the party has had a slow puncture in its support in recent times, declining from 50% in April 2012 to 30% now. This decline was in evidence in the last assembly elections when the party’s share of the vote fell by more than seven percentage points. However, the sharp spike in Conservative support is perhaps more notable. 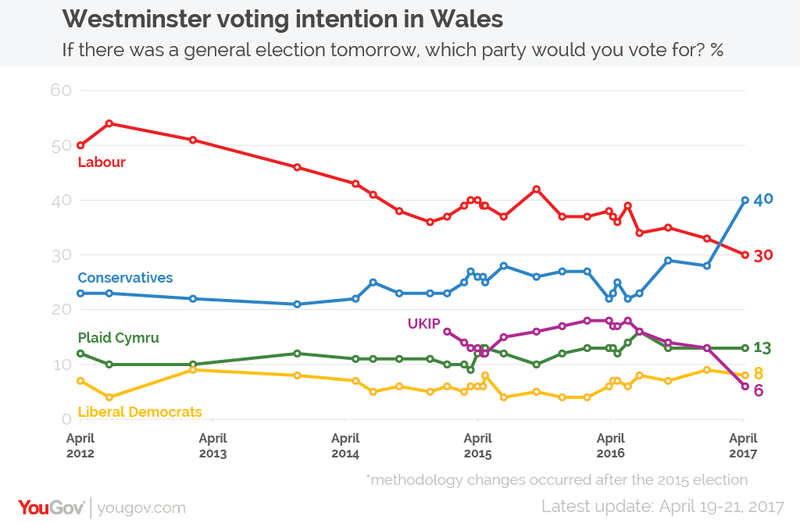 These latest Welsh voting intention figures are the highest we have ever shown for the party. While some of this increase may be down to sample fluctuation, it must be remembered that the last time we polled in Wales was in January. At that time, the Conservatives were 13% ahead of Labour in our national poll – immediately after the election was called this figure grew to 24%. So it seems clear that the Tories have been gaining ground throughout the country for some time. Additionally, it should be pointed out that there is likely to be some Brexit-related movement here. As is the case across Britain as a whole, UKIP in Wales has fallen by seven points since January and are now in fifth place with only 6% of the vote. Of those who voted for UKIP in 2015, only 32% have stuck with the party while six in ten (62%) now say they are planning on voting Conservative. Only 2% say they will switch to Labour. Given over half of voters in Wales chose to quit the EU, the data suggests that many Leavers are increasingly seeing the Conservatives – not UKIP – as the party of Brexit. While Labour leads with Remainers by 26 points, the Tories lead among Leavers by 49 points. Naturally, this is only one poll. 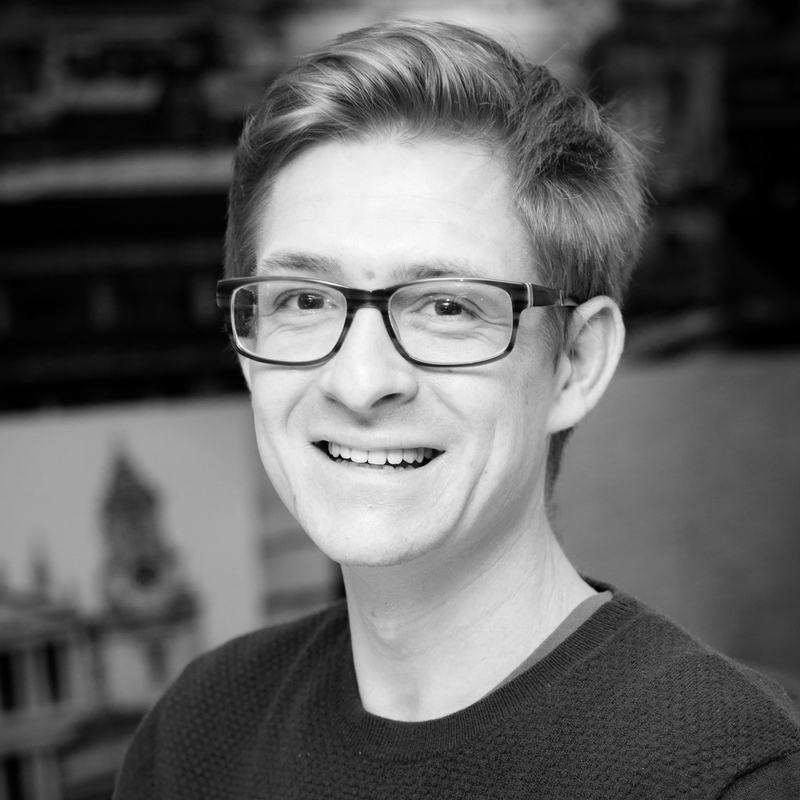 We will be looking to see if these movements are short-term reactions to the news of a snap vote and Labour regains support as the campaign progresses or part of a longer-term reconfiguration of the Welsh electorate. Wales is certainly going to be worth watching throughout the election.